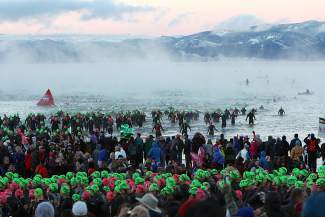 Athletes plunge into the lake at the start of the inaugural Ironman Lake Tahoe triathlon in 2013. The event is set to return this Sunday after being canceled last year due to heavy wildfire smoke. TAHOE CITY, Calif. — Barring any thwarting acts of nature, some 2,500 finely tuned athletes from across the world will put their stamina to the test in the Ironman Lake Tahoe and Ironman 70.3 Lake Tahoe triathlons this Sunday. The event’s return is a welcome sight after last year, when heavy smoke from the King Fire forced officials to cancel the races just minutes before the pop of the starting gun. One of more than 40 events in the global Ironman series, Ironman Lake Tahoe debuted in 2013 with the iconic full-distance race. Ironman 70.3, which measures half the distance of a traditional Ironman, was set to debut last year and includes 80 events worldwide. READ MORE: Tahoe-Truckee road closures aplenty for Ironman race day on Sept. 20. Based on athlete feedback from 2013, the Ironman Lake Tahoe course is among the most scenic and difficult on the planet. It starts with a 2.4-mile swim off the shore of Kings Beach before sending athletes on an arduous, 112-mile bike leg that makes two and a half loops through Tahoe City and Truckee, over 7,200-foot Brockway Summit and back around to Squaw Valley. The bike course includes nearly 6,000 feet of climbing. The race finishes with a marathon run, 26.2 miles, from the Village at Squaw Valley to Tahoe City and back, where athletes are greeted by throngs of supporters lining the finish chute. Fellow Ironman pro Joe Gambles of Australia called the course “incredible” after finishing third overall, about seven minutes behind McDonald. This year’s Ironman Lake Tahoe offers 50 age-group qualifying slots for the 2016 Ironman World Championship in Kailua Kona, Hawaii, while the 70.3 race offers 30 age-group qualifying slots for the Ironman 70.3 World Championship in Queensland, Australia. Truckee’s Jeff Schloss, a 57-year-old Nordic ski coach at the Sugar Bowl Academy, said his ultimate goal Sunday is to earn one of those coveted championship berths in his age group. Rolling age-group starts will begin at 6:40 a.m. in the Kings Beach State Recreation Area.